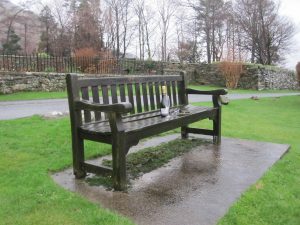 The seat at the front of Foulsyke is situated on the old carriage turning circle for the house. There are so many photos taken from there I thought it would be nice to do a feature on the seat. I wondered about a daily picture, but would I do it at the same time each day, towards the same direction? It would end up with an awful lot of pictures! 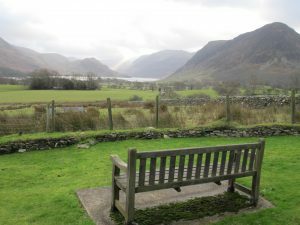 The view towards Crummock is only part of the life of the seat. 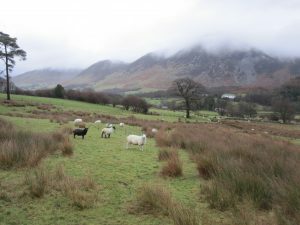 Walkers, cyclists, locals, guests, and even sheep, all at various times stop by, sometimes just in passing but at other times for refreshment, cycle repairs or just a well needed break. These, together with the ever changing views, are all part of the seat’s life and I would like to record them in some way over the coming year. I am not sure as yet how I am going to do it but probably in different ways over the year: I will see how it develops. 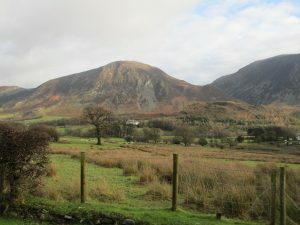 I thought I would start with a picture from each day during the first week of January: not too good an idea given some of the weather we have had! 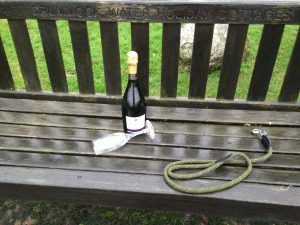 New Year’s Day, it rained all day and even the champagne glass couldn’t stay upright and I could only take photos with my back to the rain. 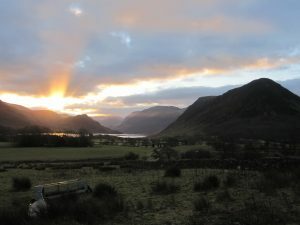 January 2nd was better and I was able to take a photo towards Crummock with a shaft of light over Haystacks. 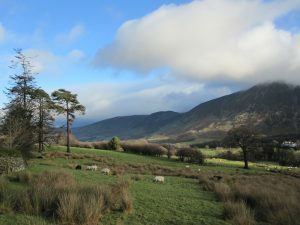 January 3rd started off with low cloud but it gradually cleared through the day and could have been quite an acceptable walking day! The following day looked set for a good sunrise, not quite as good as some of the ones we had before Christmas but certainly worth a photo. Monday 5th – the photo says it all! But then, hey presto, Tuesday is blue skies and fluffy clouds! 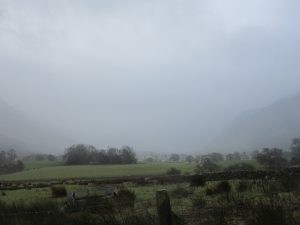 Then came Wednesday 7th when it did not stop raining all day! 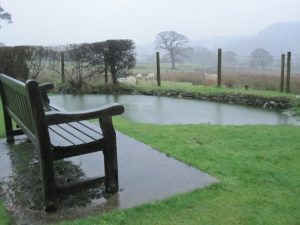 The river overflowed onto the fields by the bridge at Lanthwaite Wood and we had a little lake of our own! 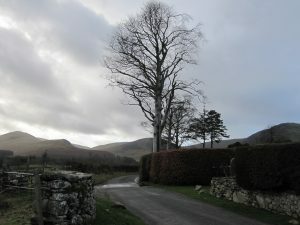 By Thursday it had stopped raining – it still looked a bit grey and wet but there was a nice wintry view along the road. These may not be the greatest pictures but I think they give a flavour of the first week of January which was very much dominated by the weather.